After careers in urban planning, health care and medical research, Lorie Pierce made a conscious choice to work somewhere beautiful, engaging and always thought provoking: the Royal Ontario Museum in Toronto. Starting as a volunteer in 2005, she now balances her volunteer roles in Outreach children’s programming with a part-time staff position in the Education Department. While the “fossils of Early Life in the Mid-Cambrian Burgess Shale” are her passion, she is equally intrigued by topics ranging from ancient civilizations to meteorites, birds and bats. Lorie has also trained in Reminiscence Therapy in London, England and is completing a Certificate in Museum Studies with the Ontario Museum Association. Do you work in a museum? Tell us about your job. You will find me at the Royal Ontario Museum in Toronto, Canada. I wear two hats at the museum – as a volunteer and as a part-time Gallery Facilitator in the Education and Programs Department. Both my volunteer and paid positions involve a variety of activities onsite and offsite including exhibit tours, school tours, assistance for programs, touch table staffing, promotions, children’s program development and co-ordination, scavenger hunt staffing, assisting with school group organizing, and Invertebrate Palaeontology database entry. Suffice to say, I am never bored. My university degree is in urban planning, which gave me an excellent grounding in research, strategic planning, human geography, and history of urban spaces. In the past few years, I have been pursuing a Certificate in Museum Studies from the Ontario Museum Association. What was your sticky moment? A love of Natural History came early. While watching my father build a rock wall in our suburban backyard, I noticed seashells embedded within the quarry stone. At four years old, I understood what types of animals lived on land and which lived in the sea. This mash up of sea life within rock was my earliest paradigm shift. Fossils have fascinated me ever since and I have hunted them both inside and outside of museums. Just over a year ago, I took on the responsibility of designing and coordinating a museum outreach program for families of children being treated for major illness. We hold the mini-museums at their 80 suite home-away-from-home which was built nearby the Hospital for Sick Children. I started blogging at the same time. Museum Talk is a way for me to show the process I go through in deciding how to share aspects of our comprehensive collections (both Natural History and World Cultures) in a fun and engaging way. I blog so volunteers and staff within the museum can see what I am working on, but also to share ideas with the larger museum community, who may have similar aims. @ROMkids – Kiron (read his Museum Blogger here) is my eyes and ears both inside and outside the museum. Plus, since we share a love of Palaeontology, I know I will hear the latest Palaeo news through his tweets. Revealing the Early Renaissance: Stories and Secrets in Florentine Art at our sister institution, the Art Gallery of Ontario. If you didn’t work in a museum, what would you be doing? I’d be somewhere being creative. Currently, I am writing an adventure book. I tweet @CreativeLorie and follow a few sites avidly for the amazing links they provide. My tweets are infrequent but I am definitely warming up to using Twitter more, especially because I love being retweeted! An aquarium. The world’s oceans are an amazing new frontier that intrigues me. Plus I am convinced I once had a past life in the Cambrian Seas. Understanding why people come to museums and how to best connect with them when they do, so that we can build on what they value in the experience. In addition to seeking education and entertainment, I believe our clientele also connect to museums on a level of reminiscence. That there are objects in our collections that remind them of their own lives, their families, their ancestral homes, their travels in a way that increases their sense of belonging and self-worth. This is an area I feel should be investigated and enhanced through how we engage the public. Get to know a curator or two. Don’t limit yourself only to areas of the museum you think you are most interested in. Be open to all aspects of museum life. There could be something amazing around the corner you never conceived of. Thanks for participating in Meet a Museum Blogger, Lorie! 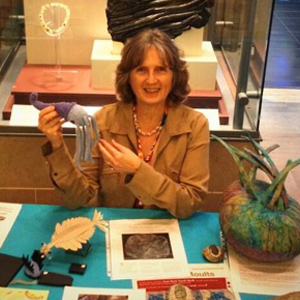 In case you missed it, Lorie blogs at Museum Talk. Do you have any additional questions for Lorie regarding her profile above? Feel free to start a conversation in the comments below or reach out to her directly on Twitter. Her Twitter handle is @CreativeLorie. I highly encourage you to use the #MuseumBlogger hashtag. TY! Tags: Art Gallery of Ontario, Museum Talk, Ontario Museum Association, Revealing the Early Renaissance: Stories and Secrets in Florentine Art, ROMKids, Royal Ontario Museum. Bookmark the permalink.